vbMAPI is a simple code library that primarily works around the limitations imposed by the Outlook Object Model Guard. 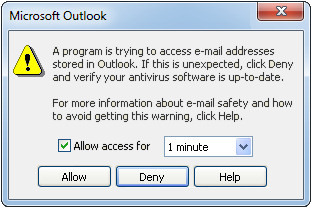 Using vbMAPI, you eradicate these types of warning prompts. After reviewing several solutions I decided on vbMAPI and have been very pleased with my selection. vbMAPI was by far the easiest to implement, and even includes a utility to add all the necessary classes to your existing projects. It's very easy to use, and the online help includes simple examples that make vbMAPI a useful tool right out of the box. This product is licensed on a per-developer basis. Each developer using the library (in any shape or form) is required to obtain a licence. Designed and tested for use with Outlook 2000 and newer. After years of trying different workarounds for MS Outlook’s security warning when sending emails through Access VBA, I finally found one that is completely painless. vbMAPI makes life simple again. No more registering DLLs on every user’s computer; no more hassles with Office versions. It all just works. Click the ‘Add vbMAPI to Project’ button and I’m ready to code. And the depth of control is amazing. There is also a solid online help system (including sample code) which lets me get what I need without fumbling around. vbMAPI greatly simplifies the process of creating emails, gets rid of annoying security messages, and not having to install DLLs etc on users machines is a major plus. I can't recommend this product enough and the quick responses and support I have received couldn't be better. In searching for a solution I came upon vbMAPI. It was like finding the Holy Grail! Installation was quick and easy. Adding vbMAPI to my Access VBA projects was simply a couple of mouse clicks AND required no additional client workstation installation or files. Within an hour I had integrated and tested it in my application. In summary, we have simple installation, integration, performance, no external file requirement, service and even low price. One can't beat that combination anywhere. Within minutes, I was able to harness the full power of the Outlook Object Model in my applications. The innovative deployment method meant that I was able to integrate this functionality seamlessly, with no need to distribute additional libraries to clients. Product support has been second-to-none, with most of my queries being answered same day and enhancements, where necessary, being released within a week. I've been using the product to its full extent for four months and it just works. I am rarely moved to endorse products - generally I consider that payment should suffice! - but vbMAPI Outlook Security Evader and its excellent development and support team deserve a special mention. 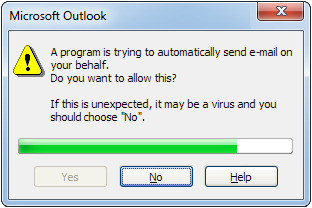 One of the things I like about your product is that I don’t have to mess around with Outlook references. Since I am developing using Outlook 2010 and some of my customers only have earlier versions, it is a great help to not have to set/remove references and use conditional compilation constants, yet I still have Intellisense. It’s worth the money for that alone.